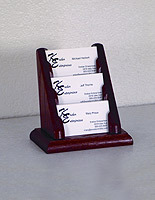 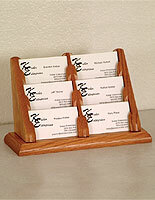 These wooden contact card holders in dark red mahogany are a great way to dispense business information and/or distribute gift coupons that are the same size. 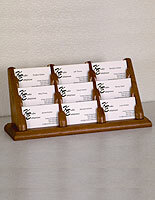 These promotional racks are typically seen on the desk at a dentist's office or at a retail checkout station. 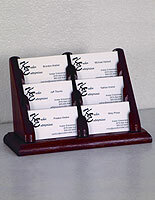 Each of these contact card holders, like some countertop office supplies, is tiered, leaving room on a desktop for other supplies. 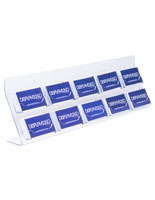 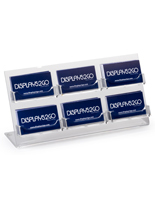 These displays hold stacks of up to 1/2" thick supplies in each of the 9 pockets. 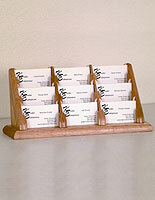 The card holders for counter mount enhance any type of decor, and last through years of frequent use, due to solid wood construction. 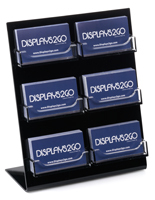 Customers have full view of the contents before they browse, which makes this an appealing fixture for retailers and clients alike.